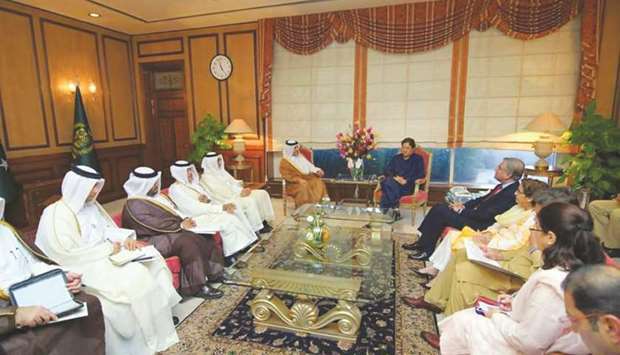 Pakistan Prime Minister Imran Khan met yesterday with HE the Deputy Prime Minister and Minister of Foreign Affairs Sheikh Mohamed bin Abdulrahman al-Thani during his official visit to Islamabad. The meeting discussed bilateral relations and means of boosting them, as well as matters of common concern. HE Sheikh Mohamed bin Abdulrahman al-Thani also met with Pakistan Foreign Minister Shah Mehmood Qureshi. During the meeting, they discussed bilateral relations between Qatar and Pakistan, ways of boosting and developing them, and a number of regional and international issues of common concern.